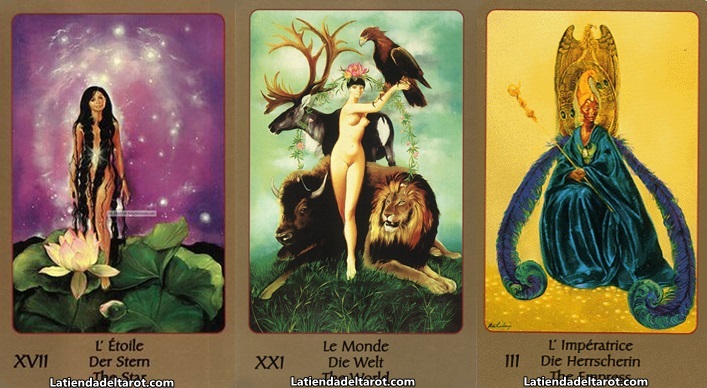 Notify me of updates to Tarot Eden "Collection"
Top » Catalog » All Our Tarot Decks » » Tarot Eden "Collection"
It consists of a pack of 78 cards plus a guide with instructions in English. 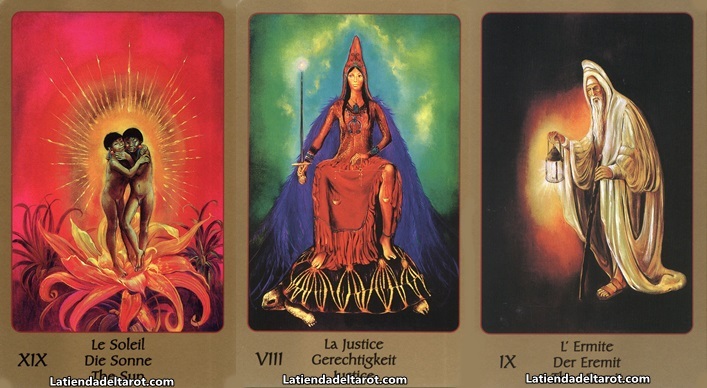 This tarot was published for the first time with the title "Zukunfts Tarot" in German edition, being renamed in the following editions besides presenting the illustrations in a slightly larger size (besides some iconographic changes). On the other hand, between the first and later editions, the edge format changes (monolingual and white in Zukunfts to gold and trilingual -English, French and German- in the later ones). 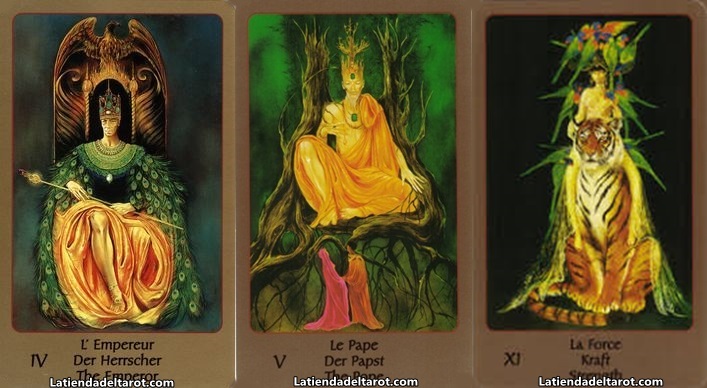 The tarot is mainly inspired by the Tarot de Marseille tradition, both in the names of the cards and in the iconography. 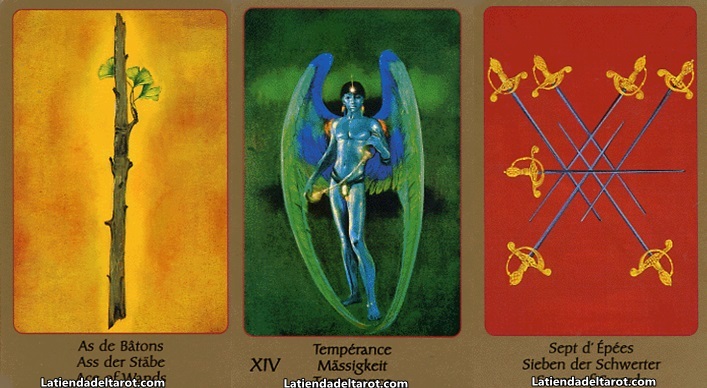 For this reason we find detailed and precious images in the Major Arcana while the Minor Arcana has a simple style, very similar to the Tarot de Marseille, with suggestive and oversaturated colored backgrounds. 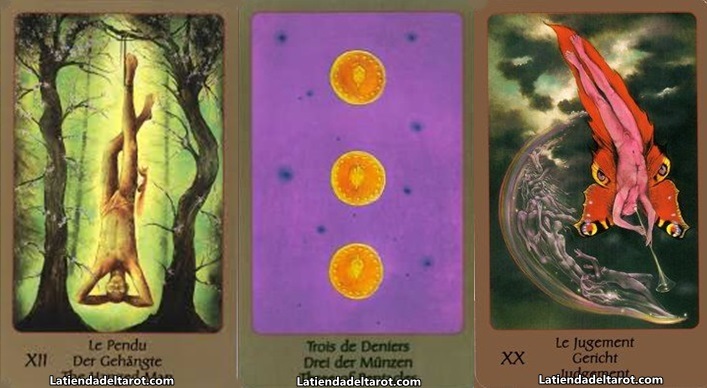 The colors of this deck, following the theme of Eden, are intense, varied, saturated and shocking. They create a striking contrast with the flat edge, in a unique and unmistakable visual style. The artist wisely combines the primary tonalities and the metallic colors, defining this style as "characteristic of his vision of the world". 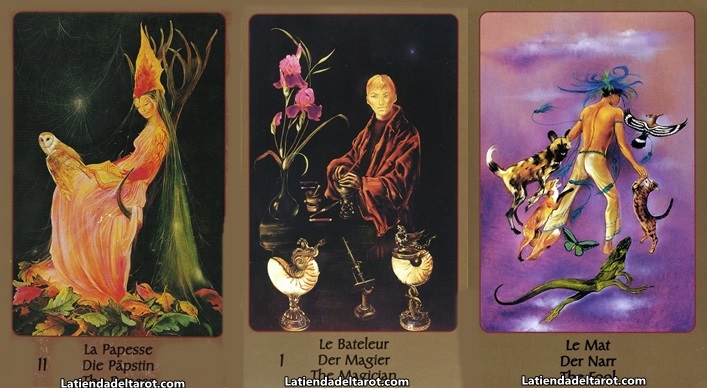 Likewise, he tells us that he tries to make "unprecedented connections" and emphasizes the ancestral origins of divinatory art. About one of the authors, Maud Kristen, we have to say that she is one of the most important seers of Germany, having appeared several times in television programs. He also declares himself an activist for the rights of animals. On the other hand the co-author, Alike Lindbergh (real name Monique Watteau) is a famous Belgian writer and illustrator, born in 1929 and with an extremely prolific career. Author: Alika Lindbergh and Maud Kristen.